Call me old fashioned but I prefer a good ol’ Danish before a Doughnut ANYDAY. Theoretically both of these pastries that were created from mistakes have evolved to not only have their own popular hashtag but to become the face of many, many businesses; well the Doughnut has, the Danish not so much. I mean think about it Doughnuts that were once single served are now wanted by many to make an appearance at their birthdays & bbqs and move over homemade pies, I want an assorted Danish wreath in the middle of all my brunches. We need specialty Danish shops, well I definitely do; I don’t know about you. Maybe we need body builders to get on them so it’s not just senior citizens and I purchasing them. So here’s the part where you may think I’m crazy and will unfollow me on social media for not being cool enough: I won’t spoil calories with a Doughnut, I don’t care how many fruity pebbles are on top, I won’t do it; but I will totally do it for a Danish. Why am I not crazy about Doughnuts like 99% of America is? I’m just not. Let’s take a step back. If you know me well you know how crazy about Croissants I am. I am CRAZY about Croissants! and not butter Croissants I like the fresh big flaky, blown up, crunchy on the outside, soft in the inside ones. This may seem very un-impressive but they’re not easy to find like bagels are (here in Jersey at least). So back to the Danish; like the Croissant and Milhojas (Peruvian puff pastry) there are all these somewhat layers of light dough that you can taste in every bite that makes it enjoyable, enjoyable dough, that to me is important. Important? I have, what some may call, the bad habit of gutting my breads and bagels. Removing the inside dough because I find it useless, which became useful in my nutritional days because it cut down my bread intake. Anyway, I’m more about what’s on my bread or inside my sandwich instead of how much dough is in it because EVERYTHING else matters when it comes to taste from the crust to the topping. 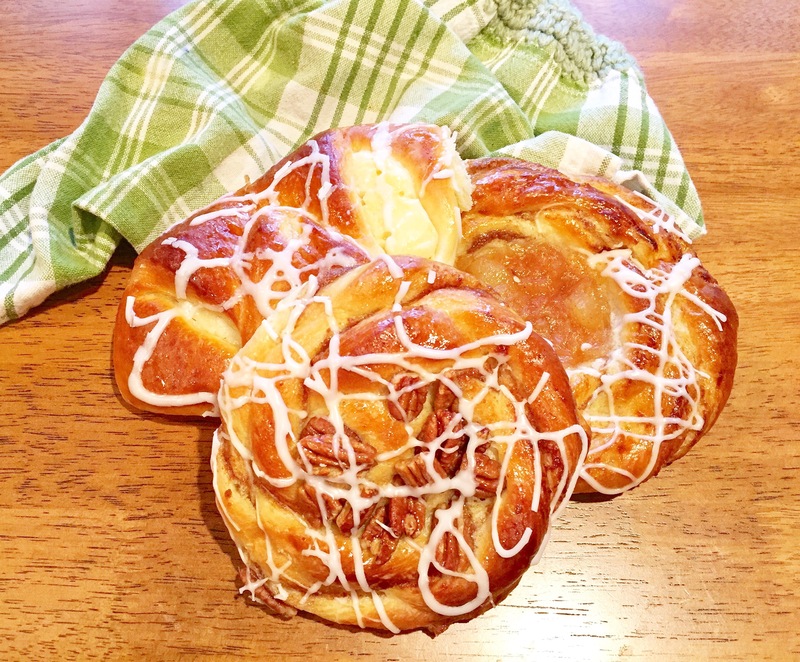 So the Danish, from its layers of cinnamon swirl layers of baked dough to its toppings from cheese, fruits jams, and nuts to its sugar glaze finish that contains elegant bites throughout its entirety, is my favorite pastry. Some may argue that the Danish is actually French – which in fact works in my favor because I love croissants, and some may call a Danish Viennese, or Copenhagener, or a thousand leaves, or folded pastry – which proves it has successfully made it around the world; whatever it’s called it is my pastry of preference instead of the Doughnut – which, and I’ll end it right here, is said to have originally come to Manhattan, when it was New Amsterdam, under the Dutch name “olykoeks” – oily cakes.